I gave away all my Simon and Garfunkel vinyl in 1997, when Columbia released the excellent Old Friends box set. I figured I wouldn’t need the LPs because the three-CD anthology incorporated all the key album tracks, but I almost immediately regretted my decision. 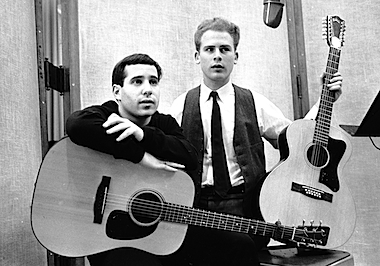 While Simon and Garfunkel made a string of wonderful singles, their LPs include almost no fluff; and though some of their tracks pack more punch than others, nearly every one is worth hearing and having. Also, sorry for the cliché, but the duo’s studio albums really are a soundtrack of my life; to fully evoke the times when I first heard them, I need to be able to play them from start to finish, and with the original song sequencing. Now I can do that, thanks to the release of a terrific new box, The Complete Albums Collection, which contains the group’s five studio albums, plus Greatest Hits, the soundtrack from The Graduate and five discs of previously released concert material. Everything but the live CDs has been newly remastered. Wednesday Morning, 3 AM (1964). This is a product of the early ’60s folk revival, and much of the program would fit comfortably alongside recordings by Peter, Paul and Mary or the Kingston Trio. The disc includes the obligatory Dylan track (“The Times They Are a-Changin’) and unvarnished readings of standards like “Go Tell It on the Mountain,” “Peggy-O” and “Last Night I Had the Strangest Dream.” But there are also hints of the more distinctive music that would follow: the duo’s harmonies are magnificent on tracks like Paul Simon’s “Bleecker Street”; and there are four other Simon compositions, including the original acoustic version of “The Sounds of Silence.” All fledgling singer/songwriters should find solace in the fact that this auspicious album initially sold a mere 2,000 copies. Sounds of Silence (1966). The instrumental “Angi” aside, this is an all-Simon program. (In fact, nine of the 12 compositions first appeared on an obscure UK-only solo album from him.) A few of the tracks, such as “We’ve Got a Groovy Thing Goin’,” have not stood the test of time but many of the rest now constitute folk/rock classics. Among them: “Leaves That Are Green,” “April Come She Will,” “I Am a Rock” and, of course, the chart-topping title track—the song from the first album with an “s” added to the title and electric guitar, bass and drums added to the mix. Parsley, Sage, Rosemary & Thyme (1966). Issued only nine months after Sounds of Silence, this disc found Simon and Garfunkel involved in production for the first time. A departure from the more traditional folk of albums one and two, it cemented the duo’s reputation as major artists and Simon’s as a superb writer. Highlights include “Cloudy,” “The Dangling Conversation,” “For Emily, Whenever I May Find Her” and “Homeward Bound.” Yes, Simon again used the word “groovy” in a title, but even that number—“59th Street Bridge Song (Feelin’ Groovy)”—sounds as fresh today as it did nearly half a century ago. The Graduate (1968). This feels more like the soundtrack it is than a Simon and Garfunkel album, if only because a half dozen David Grusin instrumentals share the program with the duo’s work. But if you’re a fan of the film (and who isn’t? ), you’ll find this disc evocative of key scenes. And while it includes only one new Simon and Garfunkel track (the chart-topping “Mrs. Robinson”), it incorporates versions of old songs that you won’t find elsewhere, including a reading of “The Sound of Silence” that puts harmony vocals even more front-and-center than on other recordings. Simon and Garfunkel’s Greatest Hits (1972). This is notable for the inclusion of live versions of “For Emily, Whenever I May Find Her,” “The 59th Street Bridge Song (Feelin’ Groovy),” “Homeward Bound” and “Kathy’s Song.” When Columbia first released the album, I griped about the absence of several classics, but my quibbles are irrelevant here, since the songs are available elsewhere in the box. Old Friends Live on Stage (2004). This two-disc collection focuses mostly on the duo’s work together, rather than on later solo work, and even includes a reading of “Hey, Schoolgirl,” a minor pop hit that a teenaged Simon and Garfunkel recorded under the names Tom & Jerry in 1957. And there’s yet another Everly Brothers cover, “Bye Bye Love”—this one with vocal assistance from Don and Phil. Live 1969 (2008). This album—which stayed in the can for four decades after it was recorded—includes excellent live versions of songs from the final two studio albums. One high point: a performance of “Bridge Over Troubled Water,” which had yet to be released on record. Garfunkel introduces it as “also one of our new songs,” then sings it beautifully, accompanied only by Larry Knechtel’s majestic piano. At the end, the crowd erupts in wild applause, cheers and whistles. It’s clear they realize they’ve witnessed the debut of a classic. Old Friends, the 1997 box, contains quite a few noteworthy rarities and it would have been nice to see them included as a bonus disc in the new package, so completists wouldn’t have to spring for both sets. Still, The Complete Albums Collection contains everything most fans really need of Simon and Garfunkel with the exception of their evocative Top 10 reunion single, “My Little Town.” You can find that on post-S&G albums from both of them and, with any luck, you’ll also find it on the project that ought to follow this one: a remastered collection of Simon’s first-rate solo records. Thanks. Actually, virtually ALL their records were from the sixties—their last studio album, Bridge Over Troubled Water, was recorded at the very end of the decade. (It was released in January 1970.) Anyway, glad you’re on to them!